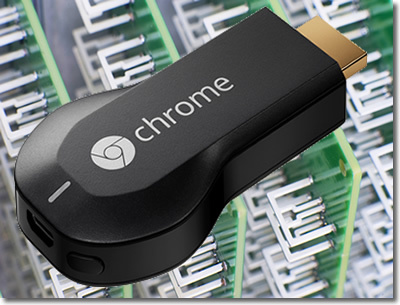 Aereo, the internet streaming service has been made compatible with Google’s Chromecast stick. allowing subscribers using the android app to wirelessly ‘cast’ to any big screen TV with the tap of the finger. Prior to today, Aereo users had to connect a tablet or phone to a TV set to get big screen local network broadcasts, but the brilliance of the Chromecast means that now after casting the stream, users can free up their phone or tablet while the streaming continues. 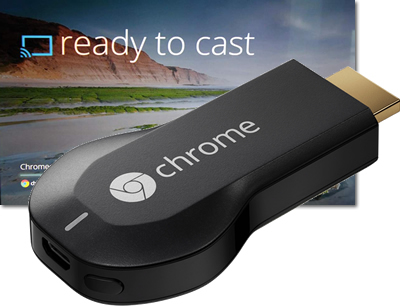 The Chromecast HDMI stick which costs $35, lets users wirelessly beam content from their computer, smartphone or tablet to their big screen television set, super easily. It is a great feature to have and will also work using the Chrome browser on a PC or Mac, Apple TV or Roku, but will it make Aereo users any less nervous about the ongoing supreme court case? The Aereo service which launched in 2012 and costs from $8 per month, retransmits over-the-air TV signals from networks such as ABC,NBC, CBS, and FOX by giving each viewer their own tiny antennae and letting them watch live and recorded content via a number of connected devices. This method say Aereo is just like each subscriber using their own antennae and is perfectly legal. But the TV networks disagree, especially as Aereo charge their subscribers but pay nothing to the networks for content. They accuse Aereo of violating their copyright and breaking the law. Although the courts have sided with Aereo thus far, (although a Utah court did temporarily shut down the service), the Supreme Court will make a defining decision by July. Until that day, current subscribers can at least enjoy easier streaming. All you android owning Redbox instant members can walk with an extra spring in your step, the service can now be beamed from your tiddly phone to any massive TV screen with a little help from Chromecast. The little $35 Chromecast dongle is becoming an essential weapon in any internet TV watchers arsenal, as it lets users flick any movie or show from mobile to TV so long as the service is Chromecast compatible. Currently compatible apps includes Netflix, Youtube, HBO Go and Hulu Plus apps. But now the Android Redbox Instant app launched last March, lets viewers cast whatever movie is being watched to any TV with a Chromecast plugged into the HDMI port. The Redbox Instant service by Verizon offers streaming from a limited library, as well as 4 physical DVD rentals for a monthly cost of around $8, as well as access to pay-to-view new titles. The cost for online streaming is pretty high though, about $4.99 for SD and $5.99 for HD rentals. You don’t even want to hear how much purchase prices are! But those Redbox Instant viewers out there frustrated with all that small screen action can now watch in full screen glory by updating the app on Android devices from the Google Play Store. Chromecast, the little smart TV dongle from Google has just got even better after getting app support from streaming services Vudu, Crackle, and Rdio. The Crackle video service is owned by Sony and offers a number of free movies and shows from both the iOS and Android apps that have had a Chromecast Refresh. Vudu is a pay to view service owned by Walmart, which offers movie and TV show rentals and purchases in 1080p HD. The iOS and Android apps are now Chromecast compatible. The service also provides UltraViolet streaming of physical DVD’s and Blu-ray discs brought from Walmart (or Asda in the UK). The $35 Chromecast stick works by casting streaming from a mobile device or web browser onto any HDMI equipped TV. Once sent, the Chromecast takes over the processing work leaving the user to use their mobile or PC while the movie plays on the TV. The stick already has support for the most important services such as Netflix, Hulu, HBO Go and Google Play store. The little stick just needs to strike a deal with Amazon to get instant prime streaming compatibility and it will have the full set, although Amazon are a little busy just now, preparing to launch a new streaming service and/or device. Flushed with the success of it’s HDMI wireless dongle, Google are set to unleash the Chromecast mini stick to more Countries soon. 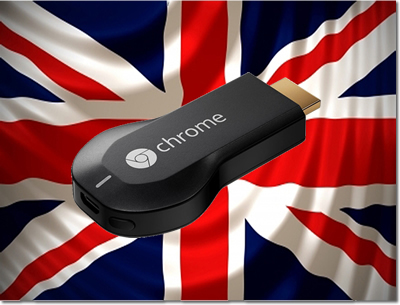 Speaking at South by Southwest (SXSW) festival in Texas, Google’s chief of Android, Chrome and Google Apps, Sundar Pinchai, said that the Chromecast would be arriving in “many more countries” within the next few weeks. The Chromecast which launched last summer in America, has sold “millions” of units, and the pace of sales are rising. Pinchai didn’t reveal which countries the stick will be launching in, or the price, he did indicate it would be launching within weeks. The dongle which plugs straight into any HDTV’s HDMI socket and offers wireless streaming from apps and browsers, is said to be heading to the UK this month, so it may well be that a launch worldwide will happen at the same time. The Chromecast costs $35 in the US, and it would be expected to be at a slightly higher price point elsewhere as with most hardware . It should still come in cheaper than the equally desirable but costlier Roku Streaming Stick, which is available to pre-order at $50.